I never thought that having kids and a resulting lack of personal space was ever going to be easy. And when I moaned yesterday, as I frequently do, that I was sick of the kids being ‘on’ me morning, noon and night, i.e. jumping on my back, pressing their bogey-filled faces onto my leg and so forth, my husband said something hilarious. “If you passed out on the floor, there’s a high chance that the kids would eat you.” Inferring that they loved me SO MUCH that they would get stuck in. No kidding. I then had visions of Bridget Jones saying that she was afraid of living alone, for fear that her body would be found eaten by Alsatians. Ha! I am never closing my eyes around my awake children again…the little bloodsuckers! Anyway. You can imagine that these days I have all the time in the world to bake, especially items that would do well for Christmas presents. I don’t. But basically, I made these biscuits fairly accidentally at the weekend because I had egg whites that needed using up and I needed to be in a different room to my children. Then, after I’d eaten about 26 of these biscuits I thought to myself that they would be really fab popped into a little bag and given to someone as an Xmas present. 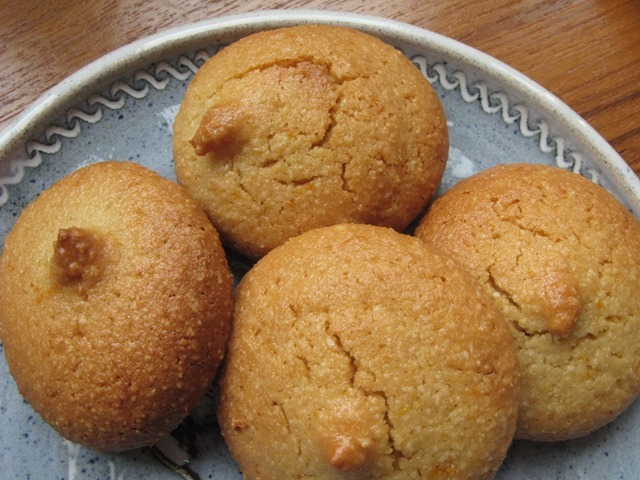 Anyone would like these – they’re really moreish and so easy to make. Great with coffee or to accompany ice cream. They happen to be gluten free as well. Just don’t make them more than three days before you give them to anyone, because they only keep for a week, max. You can freeze them for several weeks too. 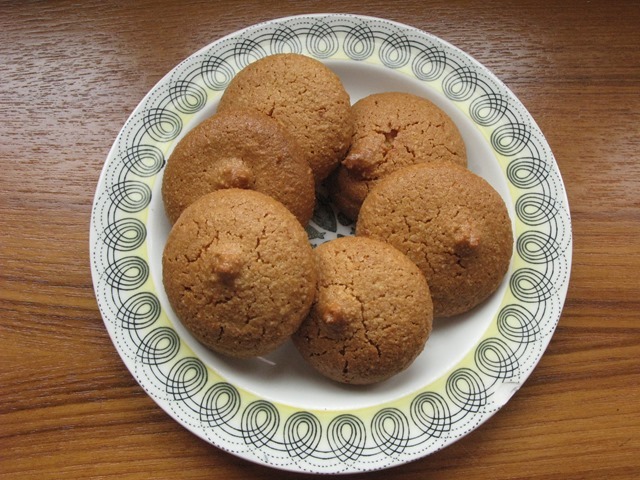 I have included two cooking times – the first is for those who like a chewier amaretti texture, and the second gives the biscuits a little more crunch with a chewy inside. The recipe makes about 50 little biscuits. You’ll be surprised at how quickly you get through them. Piping bag (easier to make uniform sized biscuits). 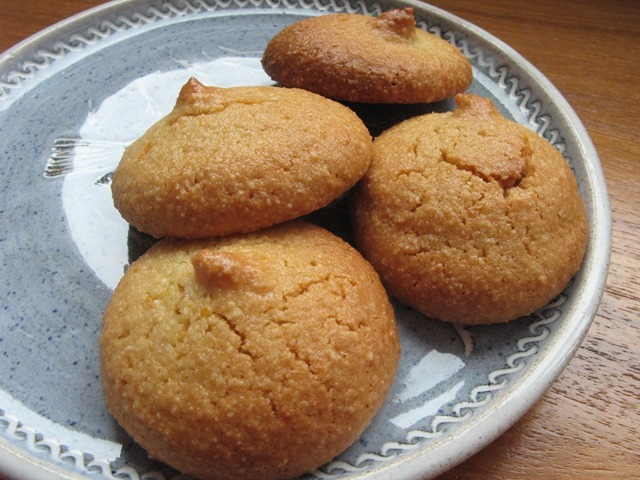 If you don’t have one, just use a couple of teaspoons to form the biscuit shapes, they’ll be less uniformly round but will still taste amazing. 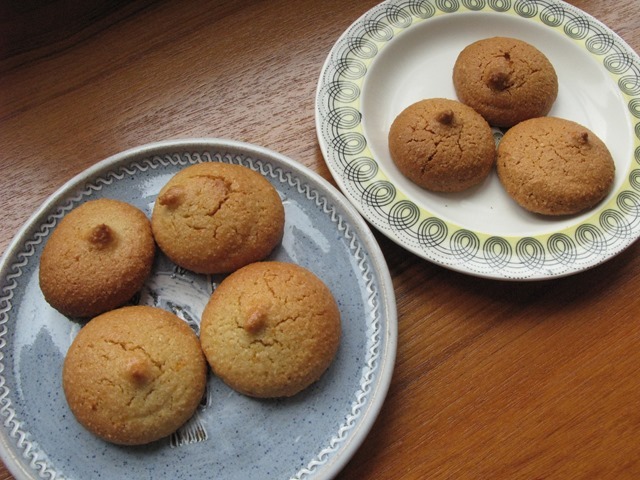 Preheat the oven to 160C for a softer textured amaretti, or to 150C for a crunchier biscuit. Place greaseproof non-stick baking parchment onto flat oven trays. (You may have to do several batches of biscuits in the oven, unless you own a lot of trays). Zest the orange rinds and keep to one side. Mix the ground almonds and 1 cup of the sugar together. In a separate bowl, whisk your egg whites together at high speed (I use an electric hand whisk) with the salt until you have soft peaks. Then add the remaining 1/3 cup of sugar, and continue to whisk on a medium speed until you have stiff glossy peaks. Gently fold the eggs into the almond and sugar mixture using a spatula so that you don’t knock all the air out of the whites. Add the vanilla extract, orange flower water and orange zest and mix together. Spoon your mixture into a piping bag. (No need to put a metal nozzle on the piping bag). Squeeze small rounds of mixture onto your baking tray, spacing each biscuit a couple of inches apart. For the softer amaretti, bake at 160C for 20 minutes until lightly golden. For the crunchier biscuits bake for about 30 – 40 minutes at 150C – check they don’t over-brown. Remove from the oven and cool on a wire rack. These biscuits keep well in an airtight Tupperware box for several days, or can be frozen for several weeks (if you can resist eating them for that long). Oh, I simply adore great pictures of food! This looks so tasty. I hope you like it and can have some fun with it. Best wishes for a fantastic Christmas. By the way, I can’t wait to try out this recipe. It looks delicious! Thanks for sharing it. Thanks Sharon – they are tasty, I have just eaten another 7 of them for breakfast!!! I love your photo that says ‘my juicer’s broken’ – that’s the one for me!